Dinner/Theatre Specials, Accommodation/Dinner Specials, Extended-stay discounts, Seniors' Specials, Wine tour packages and Spa Packages offered monthly. 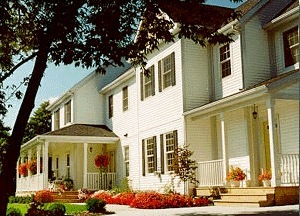 Charming, elegant, pre-Victorian style bed and breakfast accommodations with covered front and side wickered verandah. Centrally located and a one kilometer walk to Niagara's Queen Street shopping, restaurants and Shaw Festival theatres. Our guests enjoy a private entrance with a beautiful guest lounge with a fireplace, telephone, large LCDTV/DVD and bar-fridge. Complimentary juice, soft drinks, tea, coffee and water cooler. For those with laptops, we offer wireless internet. For those without laptops, we offer computer facilities. Fax, photocopying, wireless internet, email and computer facilities available. John's Gate is fully air-conditioned with an air purification system and smoke free. Located a two-minute walk to the Vintage Inn's 100 Fountain Spa facilities at Pillar and Post Inn. Walking distance to Jackson Triggs Winery and a five minute drive to Peller Estates Winery. Close to golf courses, wineries, Niagara Falls, Casinos, Horticultural Gardens, MarineLand and Game Farm, historical museums and many more attractions. 20-minute drive from the Lewiston Bridge, N.Y. Allow us to make dinner reservations for you at Niagara-on-the-Lake's gourmet restaurants or to arrange wine tours at some of best wineries in the Niagara Region - Hillebrand, Peller Estates, Jackson Triggs and Strewn - daily tours. Testimonials: I've stayed in a number of Bed and Breakfasts - other in Niagara on the Lake and elsewhere in the U.S., but, none compares to John's Gate. Inviting on the outside and beautiful, warm, and cozy on the inside, our entire experience was first class from arrival to departure. I am the executive director of a chamber of commerce and am well aware of the range of the quality and service of B&B's in our area and in other locales. John's Gate is by far the best of the best. Sharon, Pennsylvania ....having spent 20 years in the US Army, I have visited bed and breakfast establishments in numerous countries in Europe. Never have I received such wonderful accommodations. More important, never have I enjoyed the personal service you provided during our visit. Your attention to detail, ........ were unparalleled. USA My family and I wanted to send you an email to express our gratitude for providing my parents with a wonderful stay. My parents had wonderful comments on all aspects of their stay.........Please don't hesitate to use this note as a reference for assuring everyone that stays at John's Gate that they will be treated to first class accommodations , and a gracious hostess. N.Y., U.S.A. For personalized service, comfort and privacy, pamper yourself at our B&B. It beats the loneliness of hotels, motels and Inns. A full three course breakfast is served each morning. A sweet-tooth to finish with! 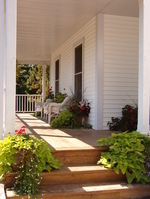 Guest Porch - Enjoy yourself!